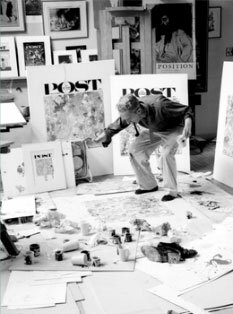 In 1961, Rockwell's studio was temporarily transformed into an abstract expressionist's workplace as he painted The Connoisseur, a painting about the relationship between conventional and modern art. 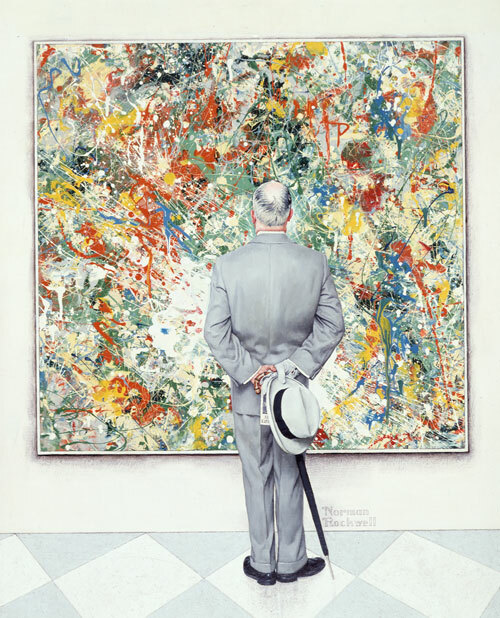 Always fascinated by modern and abstract art, Rockwell designed a cover in which he could acknowledge his appreciation of the genre. By placing his back to us, he leaves the interpretation of the museum visitor's reaction to the viewer. If we can assume that he is a surrogate for Rockwell, we may also assume that the gentleman is smiling approvingly. 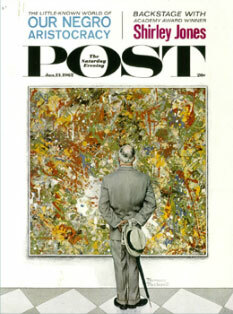 Rockwell constructed his painting in a manner similar to the work of artist Jackson Pollock. Journals in his library would have provided him with information about Pollock's process. 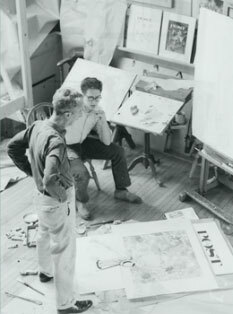 Rather than paint the connoisseur and then surround him with the abstract image, Rockwell first produced the abstract as a separate and complete image. 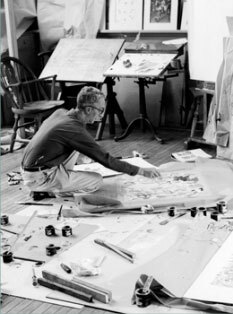 He was then able to position a cutout of his painting of the man over his abstract in order to test the final effect. 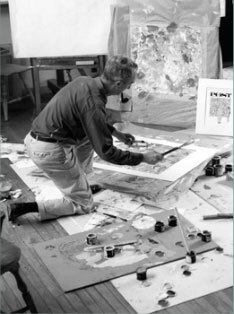 Later, he combined the images for his final painting. 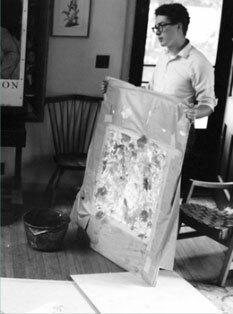 Rockwell submitted a section of the sample painting to an exhibition at the Cooperstown Art Association in New York, signing the canvas with an Italian signature. It took first prize for painting. Another section of the abstract canvas, signed "Percival," won Honorable Mention at a Berkshire Museum exhibition. The Connoisseur, Norman Rockwell, 1961. Oil on canvas, 37¾" x 31½". Cover illustration for The Saturday Evening Post, January 13, 1962. Private collection. Reference photos for The Connoisseur by Louie Lamone, 1961.